MainAll NewsForeign AffairsUS Historic Cuba Visit: 'Enriching a Tyrant'? US Historic Cuba Visit: 'Enriching a Tyrant'? Wednesday will see highest level visit in 25 years as Obama pushes ties - but will US be simply benefiting a repressive communist regime? From fruit sellers to artists drawing Havana cityscapes, Cubans are hopeful that Wednesday's highest-level US government visit in 35 years will shed Cold War-era rivalries and improve their daily lives. The US delegation will arrive in Havana following the historic decision by US President Barack Obama and Cuban leader Raul Castro in December to seek normal diplomatic relations, a rapprochement that has received some criticism in the US given that Cuba is a Communist regime. "In Cuba, we are ending a policy that was long past its expiration date," Obama said in his annual State of the Union speech late Tuesday, urging the US Congress to lift the decades-old embargo. "When what you have done doesn't work for 50 years, it's time to try something new," he said. Roberta Jacobson, the US assistant secretary of state for Western Hemisphere affairs, will be the highest-ranking American official to visit the communist island since 1980 when she lands Wednesday. Cuba will be represented by Josefina Vidal, director of the foreign ministry's US affairs, for the two days of talks. 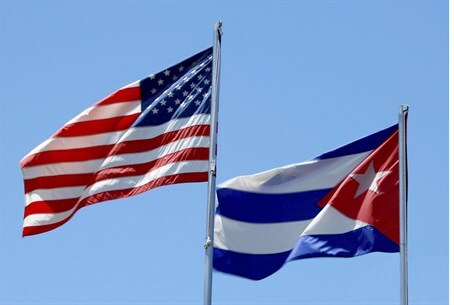 "We hope to establish civilized relations between countries that have different political concepts, but which can get along while respecting these differences," an unnamed Cuban foreign ministry official told pro-government website cubadebate.cu. However, Senate Republican leader Mitch McConnell of Kentucky has called the move a "mistake," explaining "look at Vietnam. We normalized relations with them and they are a Communist regime that still represses people. Sometimes engagement works, sometimes it doesn't." Highlighting those concerns was the fact that as US and Cuban officials prepared to meet, a Russian spy ship docked in Havana in a less than stealthy visit that had not been previously announced. As to whether the repressive nature of Cuba will change, ordinary Cubans reportedly are hoping the rapprochement will improve their lives, in a country where supermarket shelves often lack basic goods and people make $20 per month on average. "Things could change for the better, giving us a little more than what we normally have in the material and spiritual sense," said Dayron Herrera, 27, an artist who was drawing Old Havana while sitting on a street near the capital's Cathedral. Quiliano Castillo, 56, was cutting open coconuts at a juice stand, one of the small private businesses that Raul Castro has allowed since 2011. A US flag was planted in a pineapple. "It's an important time for us and the United States. It was time to sit down at the negotiating table," Castillo opined. The island's dissident community has given a mixed reaction, thanking Obama for his attempt to improve their country while voicing concern that too much was conceded to the Castro regime without getting much in return. In the US Congress, some lawmakers have criticized Obama's decision, with Republican Senator Marco Rubio, a Cuban American, calling it a "one-sided deal" that is "enriching a tyrant and his regime." Cuba feels US immigration policy is too open? The first day of talks in Havana's Convention Center will focus on migration, an issue for both nations as Cuba has seen an exodus to nearby Florida over the years. Jacobson's deputy, Edward Alex Lee, will lead the migration talks. The Cuban official said Havana will express its concerns about a US policy that gives Cubans quick access to permanent residency when they set foot on US soil. Jacobson will head the US team on Thursday to negotiate the reopening of mutual embassies, which closed after relations broke in 1961. The US side wants Cuba to re-accredit its diplomats, lift travel restrictions for them within the island, ease shipments to the US mission and lift a cap on personnel. Cuba and the United States have already taken steps to thaw their once glacial relations. The Cuban government completed this month the release of 53 political prisoners demanded by Washington, but critics say Obama has not done enough to push Havana on human rights. Days later, the US Treasury Department eased travel and trade restrictions, though the US Congress has final word on lifting the embargo, which has prevented American tourism. Some Americans visiting Cuba under special licenses that allow trips on cultural, education or religious grounds, among others, said they support Obama's move. Such special licenses are no longer needed for 12 categories of travelers since last Friday. "I'm cautiously optimistic. There's a lot of things that need to be worked out to make sure that this is not problematic and it's beneficial for both the United States as well as Cuba," said Richard Linzer, 66, a lawyer on a religious tour with a Jewish congregation from Pennsylvania.